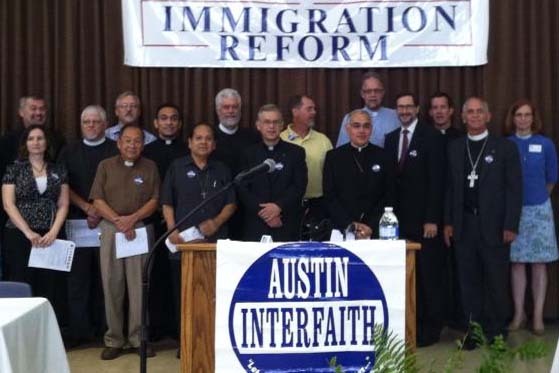 At the urging of Austin Interfaith, Central Texas Bishops, Catholic Charities and immigration reform allies, Austin City Council unanimously passed an official denunciation of Travis County's "Secure Communities," directing the City Manager to explore alternative ways to book arrests. High achieving 13-year old Alan Gonzalez Otero, from Our Lady of Guadalupe Catholic Church and Austin Interfaith, testified against Secure Communities, describing an occasion when he was 9 years old and thought he might never see his father again. Rev. Thomas VandeStadt of the Congregational Church of Austin reminded the Council that Central Texas Bishops opposed cooperation between law enforcement and immigration, and that "on principle" was opposed to Secure Communities. City Hall Chambers, filled with 300 supporters of the resolution, erupted in cheers as the Mayor announced the 7-0 vote. Austin Interfaith leaders celebrated the passage of a historic living wage ordinance they had fought for over the course of five years. Institutional representatives from congregations, schools and workers associations challenged city council candidates in 2012 to craft an ordinance requiring that jobs emerging from taxpayer incentives pay at least a living wage or prevailing wage, if higher. An economic incentive team put together language, which included an exception process, that was later adopted by a Special Committee on Economic Incentives and proposed by Councilmembers Martinez, Tovo and Morrison (and enhanced by Councilmember Riley) Thursday night. Catholic Bishop Joe Vasquez intervened reading a statement of support for the ordinance at a 6pm rally, which was later read by an Austin Interfaith leader in Council chambers. 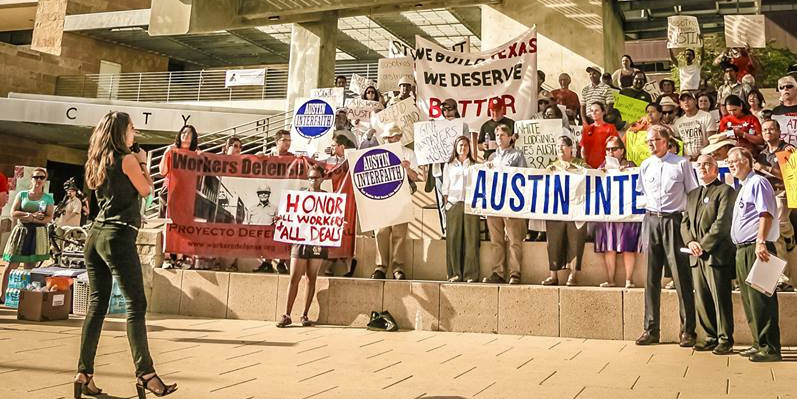 After four hours of testimony and debate, the City of Austin passed, for the first time ever, a requirement that corporations receiving taxpayer incentives be required to pay the City established living wage of $11 per hour or prevailing wages, whichever is higher. In an unprecedented collaboration between leaders from two Chambers of Commerce and judicatories from Muslim, Jewish and Christian faith traditions, 200 Austin-area stakeholders gathered for an afternoon of learning about economic, business and legal perspectives on immigration reform. This was the second event in a campaign organized by clergy leadership to support compassionate immigration reform, with the number of attendees doubling since the first event. "The switch at Travis Heights has been in the making for nearly three years. 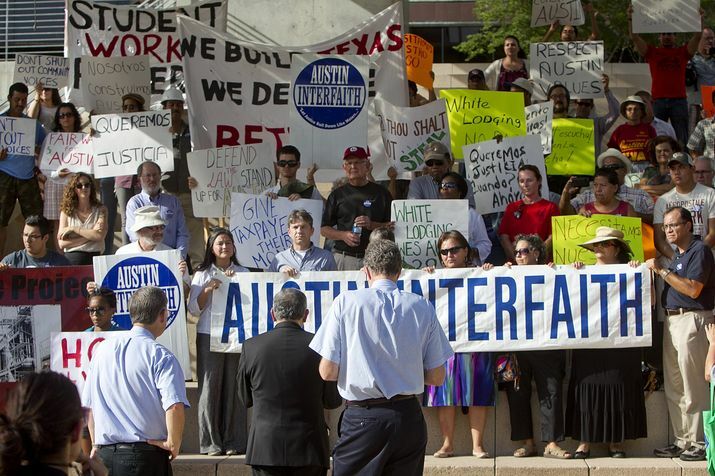 Austin Interfaith, a coalition of schools, churches and unions, and district labor group Education Austin ...reached out to 100 campuses before they found a partner in Travis Heights willing to become a charter. Their volunteers then went door-to-door, garnering support and hosting school meetings to find out what parents and teachers wanted in a school. They reached 90 percent of the school's households and got 99 percent support from parents and 97 percent support from staff...."
In a prayer service and press conference organized by Austin Interfaith, Central Texas Bishops and clergy from six religious denominations "pressed Tuesday for reforms centered on keeping families together and allowing unauthorized immigrants to earn legal residency with a path to citizenship.... such principles are key to what they called just and humane immigration reforms."